To put it mildly, the 2017-18 NFL campaign has been a memorable one for SkyCam. In a matter of months, the dual-SkyCam model — an unheard-of proposition just a season ago — has become the norm on high-profile A-game productions. In addition, the company unveiled its SkyCommand for at-home production in conjunction with The Switch, with plans to continue to grow this central-control model. In addition, last year, SkyCam worked with SMT to debut the 1st & Ten line and other virtual graphics on the SkyCam system; today, it is standard practice on almost any show using a SkyCam. At Super Bowl LII, SkyCam once again deployed dual SkyCams with the high-angle focusing on an all-22 look and the lower SkyCam focusing on play-by-play. 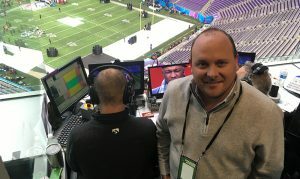 SVG sat down with Chief Technology Officer Stephen Wharton at U.S. Bank Stadium during Super Bowl Week to discuss SkyCam’s role in NBC’s game production, the rapidly growing use of the dual SkyCams by broadcasters, NBC’s use of the system as the primary play-by-play game camera on a handful of Thursday Night Football games this season, and an update on the company SkyCommand at-home–production control system, which was announced earlier this year. Tell us a bit about your presence at U.S. Bank Stadium and the role SkyCam will play in NBC’s Super Bowl LII production? We were fortunate enough to be here with Fox for the Wild Card Game, and that allowed us to keep a majority of our infrastructure in place. Also, when the stadium was built, they built in a booth for SkyCam and cabled the building, so that obviously helped us quite a bit. But we’ve been here since Sunday working with the halftime show to make sure that our rigging isn’t in the way of them and they’re not in the way of us. And then, Monday, full crew in for Tuesday first-day rehearsal, and then all the way through the week. In a matter of months, several major NFL broadcasters have adopted the dual-SkyCam model. What are the benefits of two SkyCams? We used to say you knew you had a big show when you had SkyCam on it. Now you have a big show when you have two SkyCams on it. I think one of the key driving factors for [the increased use of] dual SkyCam was working with the NFL and the broadcasters to better highlight Next Gen Stats. And, working with SMT on their auto render system, one of the big values that we now bring is this ability to show you the routes and what’s going on with each player as the play develops from the overhead all-22 position. It just so happened that, as the dual systems started to evolve, we got this amazing opportunity in Gillette Stadium when the fog came in and no other cameras could be used. Typically, you think of SkyCam as being used for the first replay camera; we’re not necessarily live. But, in that instance, we had to go live with SkyCam, and the first replay became the high SkyCam. That opportunity changed how we are seen and used. It demonstrated what you could do with SkyCam, and that obviously penetrated all the other networks. You get two totally different angles, one more tactical and one play-by-play, and there’s really no sacrifice. You’re not giving anything up on the lower system; you’re actually helping because you don’t have to chase down beauty shots and comebacks since the upper system can do that. The lower system can just focus on play-by-play. Do you expect the use of dual SkyCams for NFL coverage to continue to grow next season? I think that you’ll continue to see the dual SkyCams become more of the norm, not just for the playoff games but for most A-level shows, because it brings such a value for both Next Gen Stats and the broadcasters. We’re obviously super excited about that. I think there’s a bifurcation between audiences in terms of [SkyCam] as a primary angle: some really love it, and some don’t like it. But what you’re seeing in broadcast today with the growth of technology and evolving media is that people end up with a buffet of options to choose from: OTT, streaming, mobile, television, or something else. And there is a market for all of it. I think, at the national level, you’ll see more play-by-play action live from SkyCam because broadcasters will be able to use it and distribute it however they like. At NAB 2017, you introduced SkyCommand, an at-home–production tool that allows SkyCam operators to be located remotely. Do you have any update on this platform, and are broadcasters using it already? We have seen tremendous interest. People are asking where and when they can we do this, but there are obviously a couple different challenges we have to address: one, since it’s a cost-saving model, you’re looking at lower-tier shows in venues that don’t have much infrastructure in most cases. That said, when you take lower-tier games that happen to take place in venues that [have the necessary infrastructure], it becomes very appealing. Most of our network partners have been very interested in finding ways of utilizing Sky Command for [at-home] production. [Our partners] Sneaky Big Studios and SMT are on board, and we’re looking at doing a lot more of it in 2018. We’ve actually got some pilot programs already. Just a couple weeks ago, we relocated SkyCam into an 80,000-sq.-ft. facility a few miles down the road from our old facility. It’s a brand-new facility, built from the ground up, that’s tailored to our needs. We’ve got two entire broadcast booths with SkyCommand in mind. One is a network-operation center with full streaming capabilities and data connectivity to the games that we’re doing. Beyond SkyCommand, when our operators are onsite, we will have a guy in Fort Worth who is basically at NOC watching the game. This person will be looking at the responses coming out of the computer systems and will be on PLs with the [on-site operators]. And then we can send that video back to the NOC and address any type of issues that we have; it gives us a great ability to manage that. The second booth is where we can actually put an operator and a pilot. We’re continuing to work with the network vendors —The Switch, CenturyLink, and others — but we’ve already got full 10-gig fiber to the facility. So we’re working now to put all that in place for SkyCommand. I think you’ll see that more in 2018. In what other sectors is SkyCam looking to grow in the near future? We’re also trying to expand [permanent SkyCam installations] throughout the NFL. I expect that we will have some other announcements coming out shortly about additional teams building on what we did with the Baltimore Ravens last year. Those team SkyCams will continue to grow in 2018, and we’re looking at leveraging Sky Command specifically for those cases.